First of four shows in the Contemporary Chamber series. 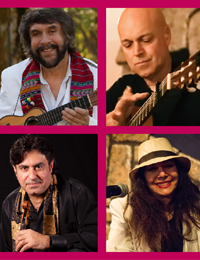 This performance features chamber music with a world music influence featuring two-time Latin Grammy nominee and virtuoso of the charango, Eddy Navia. He is joined by renown violinist Georges Lammam, master guitarist Freddy Clarke and Sukay's founder Quentin Navia. They come together in this inspired and unique performance of rumba, flamenco, Latin American, Middle Eastern and Andean music where each player brings his unique musical tradition to create an extraordinary and beautiful collaboration of international musical fusion. Free for age 18 and under. A Season Ticket Subscription Package is available up to and including the 1st performance. Package seat is $70, a $10 discount. To purchase the Package, please go back to our home page and click on "Buy Season Tickets." Or call 263-0577 and we will contact you. To Continue Click on the date you wish to attend.